VietNamNet Bridge – The Indonesian media has reported that Vietnamese top striker Le Cong Vinh may join Indonesia’s Sriwijaya FC. According to the Indonesian version of Goal, striker Cong Vinh will go to Palembang for a probation period at this FC. "We have received an attractive offer from the representative of Le Cong Vinh. The striker of the Vietnamese national team will participate in the next round of testing at the Sriwijaya FC," said Augie Bunyamin – Financial Manager of PT SOM, the owner of Sriwijaya FC. Goal Indonesia said that Cong Vinh is the current best striker in Vietnam. Vinh, 27, played for several national football teams. At the national U20 team, Cong Vinh scored five goals in nine games, while in the U23 team he had eight goals in ten games. 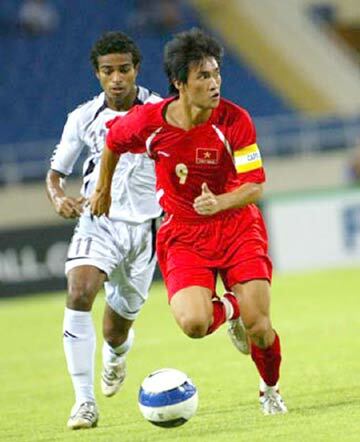 From 2004 to 2012, Cong Vinh played fifty-five games for the national team and scored thirty-one goals. Only 1m72 tall but Cong Vinh is highly praised for his ability, speed and heading techniques. "I hope that Cong Vinh will join our team. Currently there is no commitment at all, but we are very confident about this ability," Augie said. In the 2011-2012 season, Sriwijaya FC ranked 5th in the Indonesia Championship. Currently, the team is still allowed to recruit one more foreign player from Asia. Meanwhile, Cong Vinh is unemployed after the Hanoi FC was disbanded. Vinh is facing difficulties in finding a new team because he will have to pay contract liquidation fees of VND18 billion ($900,000) to Hanoi FC. Vinh has just completed the procedures for studying at the University of Sports and Physical Training in Bac Ninh.